No matter how big or small your home is, it’s going to get dirty from time to time. Beginning with the kitchen, let’s take a look at how to keep your entire home clean. Dishes are a primary focus in the kitchen. This task only takes a couple minutes if you avoid letting them pile up, so try to focus on handling dishes as you create them. You should also clean your sink regularly, focusing on areas like the faucet and handles. Keep your sponges clean by investing in a sponge holder, since these can quickly become hotbeds for bacteria. Cleaning Every Room, Including the Bathroom and Bedroom Needless to say, the bathroom should be cleaned as regularly as possible. There are a lot of products specifically designed for cleaning showers and toilets which can make this even easier for you. Same goes for grout and soap scum. In most cases, you can simply apply the cleaning product, let it sit, and wipe it away later, leaving your bathroom sparkling. Hair can get out of control in bathrooms too, so start by vacuuming or sweeping. If you try to mop without having done so, you’ll end up with wet strands of hair all over the place. Try keeping a handheld vacuum in the bathroom so you can stay on top of this! Bedroom cleaning guide The bedroom is another important area to take care of. One common piece of wisdom always holds true: make your bed regularly! In addition to what it says about you as a person, a made bed simply pulls the entire room together and creates a clean appearance. You should also wash your sheets regularly, at least once every other week. You should also make it a habit to put away any clean clothes. Dirty clothes should always go directly in the hamper and laundered clothes should be promptly folded and put away. Let’s go cleaning We need to be honest with each other. For most of the people – cleaning is not their favourite work. But is something that we simply need to do. So, when we finally decide to get to work, we can realise that the products that we have are not good enough. Sometimes the hardest part of the cleaning is actually knowing which product you can trust to ges the job done right. No single product can provide optimum performance on all surfaces and all soils. 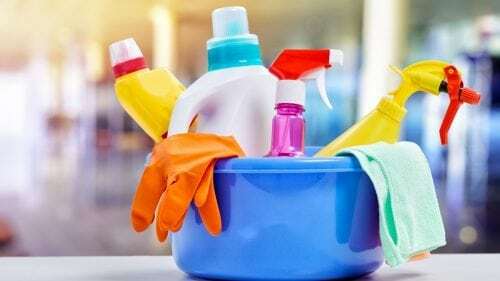 Thus, it is not surprising that many different household cleaners are available in the marketplace. They are formulated to clean efficiently and conveniently in the many different situations found in the home. What are the best products for cleaning? You need to know that some products are designed for more general use, such as all-purpose cleaners, while others are designed to work best on specific surfaces and/or soils. That can be confusing so, I want to help you with your cleaning problem. Here are some basic products that you should own to do the best cleaning that you can: All – Purpose product You need a cleaner made with gentle ingredients for skin to use it in many situations Laundry detergent Somethnig that will help you remove tough stains and protect colours and fabrics Dishwasher detergent You know it is the best when it will not left spots on glassware Disinfecting wipes Antibacterial wipes are the superheroes of cleaning supplies. They are easy to grab, disposable, and clean while they disinfect. Bathroom cleaner The best one is that which dissolves soap scum and whitens grout with very little scrubbing or effort. Duster You can use it to clean television and computer screens. Cabinet cleaner When it leaves the wood clean and smooth – this is the one. Furniture polish Good one should protect shield wood from damaging and drying sun rays. Carpet cleaner It should removes not only stains but also kill the bacterias and odors. What Does it Mean for Cleaning Products to be Natural? Over the years, there has been an increasing demand for natural cleaning solutions. A lot of families nowadays don’t want to take the risk by exposing their children and pets to harsh chemicals found in most over-the-counter cleaning supplies and experts have found many benefits in going “green”. What’s more, switching to natural cleaning products doesn’t mean you have to sacrifice cleanliness. In many cases, the natural alternatives to modern chemicals are just as effective, so you can keep that thorough clean that you love without all the overpowering chemicals and irritating odors found in industrial cleaning supplies. While most green cleaners use their own proprietary blends of natural cleaning products, there are a lot of ways you can make the switch on your own at home. All-Natural Alternatives for Home Cleaning There are some basics natural cleaning products that every home should have. These include white vinegar, natural salt, baking soda, borax, washing soda, hydrogen peroxide, lemons, microfiber cloths, and, of course, plenty of spray bottles. Depending upon which area of the home you’re looking to clean, these basic ingredients can be combined in different ways to maximize effectiveness. For instance, a simple baking soda and water paste can clean ovens remarkably well without any chemical additives. Making the change to microfiber cloths from traditional rags can also make a huge change. With high-quality antimicrobial microfiber cloths, you can basically clean any surface in your home with just water! For tougher cleaning jobs that can’t be tackled by a microfiber cloth, you can make your own scouring powder. Combine 2 parts baking soda, 1 part salt, and 1 part borax for a cleaning solution which can truly handle just about anything. These are just a few examples, but with the basic ingredients listed above, you’ll never have to rely upon harsh chemical cleaning products again and your home will love you for it. You may have seen window cleaning going on outside of an office building downtown, or on many commercial or residential properties. But you may also have wondered, why are window cleaning services necessary? There are a number of benefits and upsides for your home or commercial property utilizing window cleaning services. Here are just a few: Whether your business is located downtown, or in a suburban office park, you probably know how much of a difference a little natural light can make to workplace happiness and productivity. Office cleaning services can help ensure your offices are well-lit, warm, and welcoming to your customers, clients, and business partners when they visit. For a residential property, dirty windows are often one of the first things any visitor or potential home buyer may notice when they visit your home. If first impressions are everything, than you don’t want to leave this to chance. Window contractors providing house cleaning services can ensure that your home’s curb appeal is as strong as ever. For small business owners, having clean windows is just as important as it is for homeowners. Any small business owner knows how important it is for pedestrians to be able to look through your window displays to decide whether to spend money in your business. Window cleaning can keep your business welcoming and inviting to potential new customers who just happen to walk by. Now that we’ve covered the benefits of using window cleaning, what actually gets done to keep them clean? Generally, windows are brushed with a special cleaning solution that helps to remove dirt and grime that may have accumulated from the weather or traffic outside. Then, window cleaning professionals will squeegee the glass to remove the dirt as well as the cleaning solution, leaving a pristine glass surface that will be clear and streak-free. 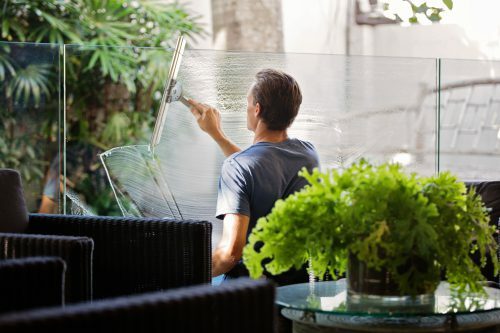 Finally, window cleaners will wipe the edges with absorbent cotton towels, to make sure the frame is clean as well. At the end of the day, using window cleaning services can be a small but important step to improving the success of your business or the image or aesthetic value of your home or commercial property. With just a little bit of work, clean windows can make your entire property shine and be more welcoming to any visitor or neighbor. There really is no downside to choosing to use them.